People often ask me how I ended up in this little niche, at the intersection of folk and coversong. Usually, I just shrug, mutter something about liking covers and folk music, note my tendency towards being a somewhat obsessive collector and tracker of songsources in general, and move on. But there’s more to it than that. And as we near our third anniversary, I thought folks might like a more substantive glance behind the scenes. This week, then, we’ll offer some reflections on the process of coverblogging: a set of recommendations on how to keep up with the folkworld and the covers it contains today, followed by our traditional subjective look at the blogger’s life on Wednesday, our actual anniversary. 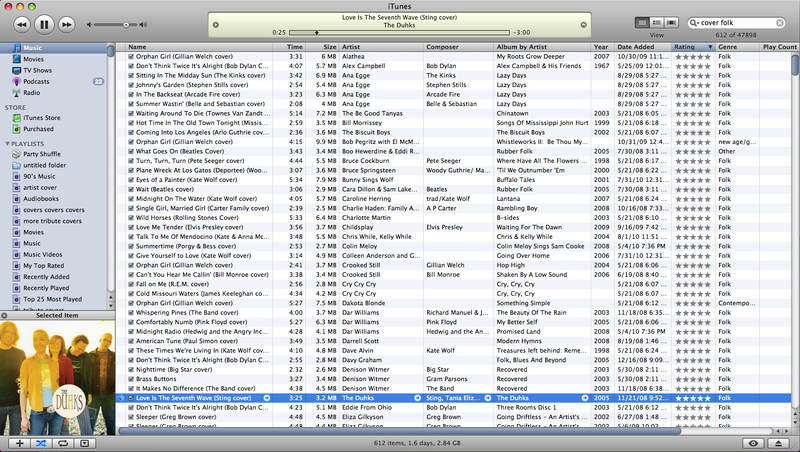 If you find this sort of stuff boring, feel free to skim right to the songs. Interested in the folkways, particularly in how songs move through culture via reclamation and repetition? Want to be a coverblogger, or just know enough to be one? There’s a whole host of evolved nuances involved in doing it well, of course, and I can’t claim to have the only method around. But it seems to me that there’s a finite number of basic practices that are vital to building and maintaining a strong covers collection. Here are three habits I, personally, find most useful as a blogger and audiophile. As I’ve noted often in our ongoing series on new tributes and cover compilations, the cover album is the coverlover’s bread and butter. Not all cover albums are created equal, of course – far too many are sheer tripe, better in concept than implementation; even the ones with promise often turn out to contain but a small handful of worthy tracks among the chaff. And those like myself who prefer to focus on a particular slice of the genre spectrum should be prepared to pick and choose tracks from multi-genre tributes, while skipping over those which truly don’t sound like what you listen to. But because they offer such concentrated and dense coverage, finding and collecting strong, full albums of coversongs remain the easiest way to satiate the gatherer’s urge. The category includes both multi-artist tributes to single artists, albums, or eras, and single artist tributes to their influences (and, rarely, single artist tributes to single artists; see our early September feature on Mark Kozelek, who has recorded full albums of AC/DC and Modest Mouse songs, or our February feature on Tim O’Brien, which includes a pair of tracks from his mid-nineties Dylan tribute Red On Blonde, for recent examples of this concentrated approach). 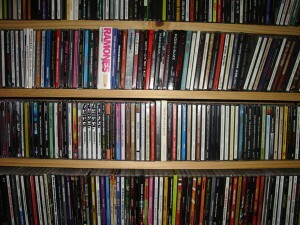 And taken as a whole, these albums form the foundation of any coverblogger’s collection, providing fodder for blogs such as our own. We’ve featured many such albums in our ongoing journey here at Cover Lay Down. Their releases find space in our ongoing Tribute Albums and Cover Compilations series; their tracks quite often form the foundation of theme posts and Single Song Sundays. From top favorites A Nod To Bob and Going Driftless: An Artist’s Tribute to Greg Brown, both of which can be found on the wonderful Red House Records label, to the myriad mixed-bag tributes which scatter my shelves, it is these albums which lie at the core of my catalog, the go-to discs which I turn to when I need a full hour of coversong on the road. And the steady stream of concentrated coverage seems endless, especially in a world where recycling is fast becoming the norm. In our first few years, we were proud to feature new releases such as Cinnamon Girl, a wonderful all-female grunge-to-folk tribute to Neil Young, Splice magazine’s all-digital tradfolk tribute, and last year’s Teach For America tribute to the singer-songwriters of the 60′s and 70′s. We’ve seen excellent tributes to Judee Sill, Kath Bloom, Shel Silverstein, John Prine and more. And I’m really looking forward to the newest addition to the roster, a track-by-track tribute to Dylan’s seminal 1965 album Bringing It All Back Home due to drop on October 5th on Reimagine Music, with Denison Witmer, Ane Brun, William Fitzsimmons, Julie Doiron, and more of our absolute favorite artists from the delicate side of the indiefolk community. We’ll continue to bring you such celebrated albums as they come, of course. Recently featured tribute albums Be Yourself: a Tribute to Graham Nash’s Songs for Beginners and Riding The Range: A Tribute to Townes Van Zandt remain on my playlist, but those posts are also still “live”, so I won’t repeat them here. And the above-mentioned tributes, while all excellent, have graced our pages in feature form before. But in the interest of transparency, and of staying true to our mandate to constantly share and promote the best of the world of coverage writ large, here’s a short set of songs from some more of my own personal favorites – at least, the ones which run folk or mostly-folk all the way through. As our mandate suggests, coverage can have a powerful impact on fan familiarity, offering an invitation to those who would otherwise never bother. And in my experience, musicians take advantage of this fact, with both new and established artists often sticking a cover or two – or more – on each album. Which is to say: some folk artists, especially those who lean closer to traditional styles and influence, mix covers with originals fluidly throughout their career; others tend to hew closer to the latter side of the singer-songwriter label. But eventually, almost every musician records a cover or three – even if it’s under duress, as with some of the artists who we’ve hosted for our still-growing house concert series. So just because an artist has never recovered a beloved or otherwise-obscure song, or simply hasn’t taken on one that made you hit repeat ad infinitum, doesn’t mean their next album or radio station appearance won’t contain your newest favorite cover. And just because that new debut is one of two dozen arriving simultaneously in the ol’ mailbox doesn’t mean there isn’t a delightful new take on someone else’s song hovering there in the middle of the tracklist, just waiting to tempt you into listening more closely to that artist’s original work. And the only way to know that is to keep attending festivals and shows, visiting artist webpages and myspaces and YouTube channels and those blogs and websites which specialize in bringing in artists for intimate sessions, and buying and listening to new music from all your favorite musicians and labels, all the time. My long-term commitment to bi-weekly coverage has shifted my awareness of new original works, I suppose. The urgency of promised output here on Cover Lay Down has had no small effect on what and how I listen to music, and on weeks when my time is especially dear, I often find myself sticking to covers exclusively, even as new works by some of my favorite artists come down the pike alongside the rest of the everflowing river of new sound that streams past my ears. The big idea here, though, is that not all covers come on compilations. Some of my most favorite coversongs have emerged from the serendipitous moment, when a favorite song appears in the hands and voice of a favorite artist. More significantly, our claim of coversong’s comfort applies to my own habits as well: hearing a familiar song in the hands of someone new has quite often brought me to appreciate that new artist, and make me more willing to consider their own songwriting. And some of the covers we’re shared here over the years arrived in disguise, only proving themselves covers upon reading the label; as we’ve written about here on these pages over the years, uncovering these gems, and realizing that they were covers after all, was how I discovered Buddy and Julie Miller, in fact, and how I came to truly appreciate both Tom Waits and Richard Thompson. One reason I still prefer CDs to downloads, in fact, is that unless the artist is heavily promoting their newest coverage, downloads often do not come with enough data to know if a given song is a cover at all. To stick to the obvious one-off and the tribute album, then, is to miss the obscure and the unknown, those dark and half-hidden spaces from whence the best of the world can emerge unannounced. Here’s a few favorite covers that first found me as deep cuts, so good that they either turned me on to other artists, kept me listening to their interpreters, or both. Like all bloggers, I suppose, cover bloggers come and go. When we joined the cacaphony of voices three years ago, the most popular coverblog on the web was Eliza’s Copy, Right? ; within months, she decided to close up shop for good. Kurtis has scaled back his Disney cover blog Covering the Mouse, moving from a daily posting model to something more sporadic after a reasonably long period of radio silence. And just this month, Jamie Fong of Fong Songs put his blog on “indefinite hiatus”, going out with a bang by counting down his top 101 cover songs of all time. But other coverblogs are thriving in the modern environment. Cover Me, for example, which started our around the same time we did, is growing fast and furious, thanks to both a new commitment to much more frequent posting and a new partnership with MTV. Podcaster Brian of Coverville has even gone pro, with advertising and sponsorships supporting a growing spectrum of programming each week. Constant companion Cover Freak remains a steady player, bringing diverse sets to the world each Sunday. And, as our sidebar notes, a number of new coverblogs have arisen in the past few years, and some are quite good indeed. And Cover Lay Down? To say I’ll be here forever would be hubris, and surely lead to folly. One day, like all things, this, too, shall pass into memory, hopefully on our own terms, with our head held high. But never fear; I’m not ready to throw in the towel yet. Three years in, I’m happy to report that the horizon remains clear and crowded with coverage: there’s still tunes to be shared, artists to celebrate, features to be written, folkway paths to be considered. We’re here, and we’re glad you’ve chosen to join us on our little journey. Happy Birthday to us, indeed. Here’s Jamie Fong‘s favorite cover; a Disney song interpretation I picked up from new coverblog Torre De Canciones and passed along over at Kurtis’ place; and an exclusive recently found on Cover Me, well worth passing along. To celebrate ourselves, and to keep the torch burning. Cover Lay Down turns three years old on Wednesday. Come back then for How To Be A Folk Coverblogger, Part 2, wherein we address the blogging life, and run through our annual review of the writing process. 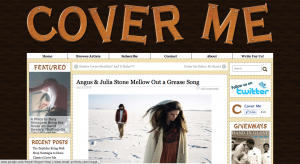 Welcome to Cover Lay Down, a new music-posting blog devoted to the art of the cover song. Sure, there are plenty of other cover blogs out there, but I think there’s still room in the niche. Specifically, though I must confess some dozen gigabytes of my currently full-to-the-gills pre-video iPod are covers from across the vast genre spectrum, here at CLD we’re folkies first and foremost, and — despite the fact that folk music could be said to have invented the very premise of songsharing and covering — I’ve noticed a dearth of both covers of folk songs, and folk covers of non-folks songs, cropping up on the usual coverblog suspects. Don’t get me wrong — I love those guys. I’m not knocking Copy, Right’s fondness for the eighties, or Fong’s incredible ability to compile cross-genre coverlists the likes of which I’ve never seen. And the broader tendency in the blogosphere towards promoting what I like to think of as the indie music mutual admiration society produces great collections — for example, my wonderful playlist of several dozen covers of Feist’s Mushaboom. I love this stuff in any flavor, visit the “other cover blogs” at least once a week, and could not stand here before you today were it not for those giant shoulders muscling their way forward over the past few years. But I hope to embark herein on a journey that focuses on the acoustic and the stripped down, the singer-songwriter paying tribute to their influences, and the influenced paying tribute to the old folk standard. There will surely be some duplication — this would be the place to find Nina Gordon’s folk cover of Straight Out of Compton, were it not already out there — and there will surely be the usual genre-stretching, especially since the folk realm overlaps so much with the rest of the music world these days. But I think there’s a new angle here, and I’m ready to share. So let’s get on to the music, shall we?